Brake pads are expendable parts, meaning that they will wear out in regular use. The life expectancy of brake friction material varies depending as much on driving style and environment as it does on vehicle weight and size. That’s why you have to inspect brake components regularly. If you start to hear a light chirping sound as you turn your steering wheel or when you lightly apply the brakes, but the chirp stops if you squeeze the brake pedal harder. You are officially notified that it is time to look at the brake pads. This guide is what you need when it is time for you to get the best brake pads for towing. Do Ceramic Brake Pads Wear Rotor Faster? When shopping for the best brake pads for heavy towing, I advise you to go for multi-purpose models for towing and heavy-duty applications. In this case, you need pads that will survive the extremes of high temperatures and hard working. The products you choose have to take into account the economic consequences. For example, it should not be overly harsh on the rotors. Another significant feature of heavy-duty pads is an excellent insulation layer. Pads with superior insulation will transfer heat effectively, preventing boiling of the brake fluid. From my reliable research, a lot of brake pad manufacturers tend to vouch for semi-metallic pads versus the new-fangled ceramic blends. I have also observed that different manufacturers, such as Wagner and Hawk heavy-duty pads are semi-metallic and not ceramic. Generally, most manufacturers will discourage you from using ceramic pads for towing. 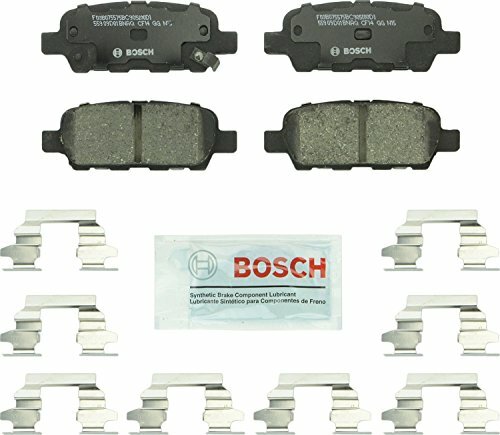 If you search for the best brake pads for towing, look no further than the Bosch BC905 QuietCast. These are some of the most popular pads in Asian, European, and North American vehicles. This is so since Bosch has been a key player in the braking industry. Leading the way as an inventive as well as environmentally conscious brand, Bosch’s copper-free formulation matches the performance of heavy-duty vehicles. The advanced ceramic friction formula features aluminium based alloy that is usually used in aerospace engineering instead of copper. Bosch QuietCast is integrated with a protective transfer layer on the pad surface as well as the rotor. This helps greatly to increase the life of the rotor as well as the pad. The manufacturer uses enhanced manufacturing, which produces a high-quality shim that is long-lasting. The shim is highly corrosion resistant, strong, and produces less noise. Bosch friction materials comply with the highest level of safety. First, they undergo a number of endurance tests in the lab and tested at dynamometer and inertia using testing standards. The friction mixing process starts with an excellent recipe. The ingredients are precisely measured to guarantee repeatability and consistency. 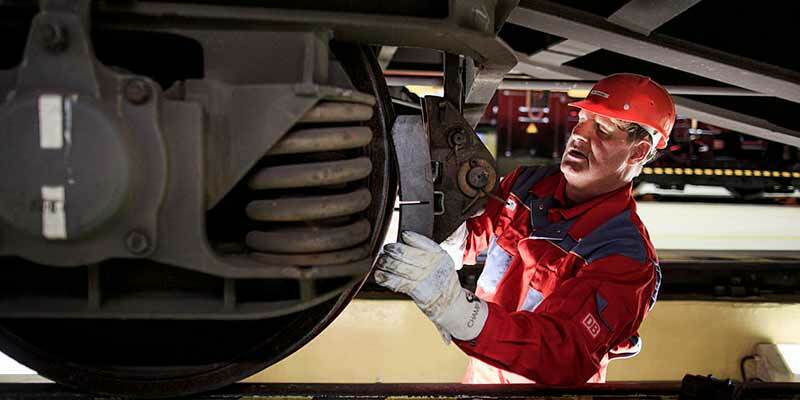 The Bosch QuietCast brake pads have been thermally conditioned to high temperatures, giving them the structure they need to warrant high strength and tough performance. What is probably most impressive about these pads is their riveting attachment, which makes them highly flexible. These are exceptional braking pads. However, you must match them with the correct type of vehicle. Otherwise, they may be hard to modulate and even result into loss of mileage. To get your truck excellent braking performance, specially when towing or hauling, you will need this amazing Power Stop K6268-36 Brake Kit. This is the most affordable brake upgrade kit on the market for truck and tow. You get all the components you need in a single kit; no more guesswork. This complete brake kit comes with a full set of Power Stop legendary rotors combined with Power Stop Z36 extreme truck as well as towing brake pads. They give you the extra stopping power and reduced fade for your F-150 when getting thrown around off-road or while hauling and towing your boat or any other gear. The Z36 series pads in this kit are made using a carbon fiber ceramic compound. This is a proprietary formulation designed by Power Stop. The carbon fiber reinforces the pad compound to withstand heat as well as improve stopping power. The ceramic design also delivers grander resistance to brake fade. The key to any heavy-duty brake pad is giving you the confidence to stop whenever you need to; whether you are towing a load or driving at high speed. While typical aftermarket pads loose half of their braking power, even after just a few stops. The Z36 truck and tow pads have a high coefficient of friction when you need it the most. These pads also include upgraded hardware, in case you vehicle requires them, such as rubber pin bushings and anti-rattle clips. Each kit comes with drilled and slotted rotors. The rotors are zinc plated to not only look great behind your wheels but also to help prevent rust as well as corrosion. Power Stop rotors are cast using OEM metallurgy. They are also machined and balanced to strict tolerances for long life. The only complaint that I have about this kit is the lack of brake calipers, which in my case, I had to buy separately. 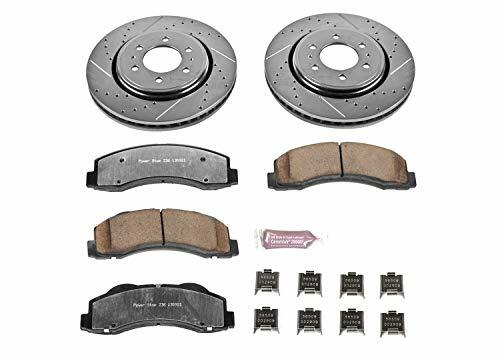 If you are looking for the best brake pads for RV towing, you should look no further than the Power Stop K3167-36 Z36 Series Braking Kit. This Z36 series model is specially engineered for your truck, SUV, RV, or 4 x 4. According to the automotive community, this is one of the most affordable braking kits for towing. Power Stop understands your needs better than any other brand out there. They have included in the kit, well-matched pads and rotors along with upgraded hardware. The kit includes everything you need for the front as well as the rear axle. The kit offers unmatched braking performance for driving through hilly or mountainous terrain. This kit contains upgraded ceramic pads that perform superbly during towing, contrary to popular beliefs about ceramic pads. The pads feature a carbon-fiber ceramic formula that is not only low dust but is also strong and delivers severe-duty braking without forfeiting everyday drivability. Apart from the excellent stopping power, the carbon-fiber ceramic formulation ensures there is dust-free friction. This guarantees noise-free stopping, especially during towing. Another impressive inclusion in this kit is the rotors. They feature G3000 metallurgy, and they adhere to strict OE tolerances. The rotors are plated, slotted, and drilled to perfection. This ensures a risk-free bolt-on upgrade that does not require any expensive modifications. The drill holes and slot patterns on the rotors are custom engineered for every application. The drill holes offer maximum cooling for the rotor, and the slots help to wipe away brake dust and debris. Some drivers in the automotive community complain that the rotors wear out faster than usual. Just make sure you don’t receive and accept a defective kit. These are among the best brake pads for RV towing. They are race proved and steel legal. 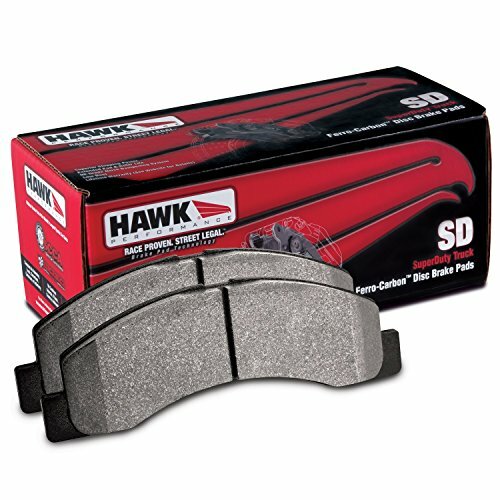 Hawk Performance provides a complete kit for upgrading your vehicle’s brakes to effectively improve your RV’s stopping power without the need of pricey calipers. The heavy-duty pads combine the feel, look, and durability of true performance pads with the convenience and fitment of OEM design. These SuperDuty pads are engineered from Ferro carbon materials, manufactured and developed for racing, towing, and hauling. According to the manufacturer, the Ferro carbon pads are not only non-fade, but they also provide lower wear rates compared to competitive materials. The Ferro carbon provides a greater coefficient of friction over stock braking pads in the market. This material can provide 20 to 40 percent additional stopping power. The pads come with a molded design that integrates the insulator, backing plate, and friction material into one high-strength piece. The application-specific construction spreads out vibration, sound, and heat over a larger surface area for effective and quieter braking. These are undoubtedly among the best as far as hauling and towing go. However, you can achieve their full potential if you use them with drilled or slotted rotors. Drilled or slotted rotors are specifically designed to help with cooling. They also ensure any brake dust or debris doesn’t stick around. There are hardly any complaints concerning these pads. But, I strongly urge you to use them with the correct vehicle models. For example, they may not be a good fit for the 2000 Dodge Ram 3500. 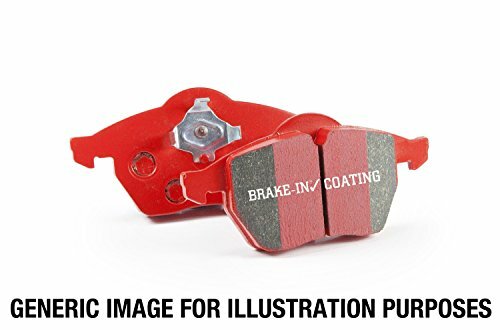 The Motorcraft BRSD -756 Brake offer advantages over most competitive aftermarket brakes. They are among the best brake pads for heavy towing. Conceivably, the biggest competitive advantage Motorcraft pads have is that they meet all federal motor vehicle safety standards. Motorcraft friction linings are vehicle specific tuned for each vehicle application. When you get into the aftermarket formulations, these pads offer unmatched stopping power. The pads come complete with all attachment hardware. So, you never have to reuse old hardware. That’s something many competitors skip. But that’s not all; there are still more features included on these amazing braking pads. For example, the shims are thin pieces of steel with multiple layers of sound dampening materials. The Motorcraft shims come attached to the backside of the backing plate and reduce vibrations that usually cause squealing. Chamfers have angled edges on the trailing and leading ends of the pads. They reduce the pads tendency to dig into the rotor, which reduces stick-slip vibration that can cause brake noise. These pads have unique slots. That significantly reduces the affinity of the pads to bend when heated under normal braking. The slots also help to reduce brake fade by providing a passage for gases to escape at high braking temperatures. These severe duty pads feature abutment points that help reduce rattle and clatter to ensure uniform pad wear. I would also like to mention that Motorcraft re-manufactured brake calipers are provided in both loaded and unloaded designs, and they will fit a wide range of budgets. Some drivers in the automotive community complain that these pads squeal, but I think it depends on your vehicle type. EBC feels that the first step when upgrading your brakes is to upgrade the brake pads of your towing vehicle from original equipment materials to ceramic pad compounds. The friction material does not compress easily when pressure is applied. They have an improved initial bite, and they significantly reduce pedal travel. The ceramic pads are integrated with a Kevlar based fiber material that is enriched with ceramic elements as an alternative to metallic steel wool. Formulated specially for heavy towing with greater performance levels, EBC Redstuff can withstand the heat produced by heavy loads. While they offer a gradual level of hold; their stopping power is substantial compared to heavy-duty brake pads. Unlike most conventional brake pads, EBC Redstuff has undergone independent tests at a hundred miles per hour. They have presented remarkable braking performance by fifty feet. These upgraded ceramic pads provide remarkable cooling performance under severe duty conditions. When paired with perforated rotors, they reduce heat buildup significantly. I do also admire the vertical groove at the middle of the pad and the angled chamfers, which ensure there is the minimal rotor or disc damage. The manufacturer has a fitment chart on their official website where you can confirm your accurate fit. Even though the manufacturer claims that they are low dust; there are a few drivers out there who claim otherwise. Are you in the market in search of the best brake pads for RV towing that will not exhaust your pocket? 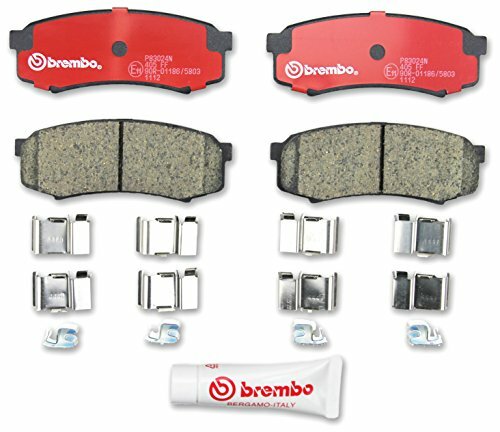 Choose none other than Brembo Brake Pads. Engineered as well as tested for performance-focused vehicles and towing, these heavy-duty pads are the ideal aftermarket for any braking system. These pads have been designed for any driver or vehicle owner who wants to make the most of his or her vehicle potential. Although Brembo has a cheap price tag, the pads will exceed your expectations. They are less abrasive, cleaner, and less harsh on discs or rotors. The friction factor of conventional pads may be lower; the Brembo pads have an exceptional factor. Therefore, expect to notice a significant improvement in braking when towing. Brembo pads tend to be very effective at resisting fading compared to conventional products. They may initially fade once or twice before settling down. Grooves, slots, or cross holes on the pads, in discs or rotors break down the surface gas film when the pads overheat. As far as fitment is concerned, I would advise you to confirm the fitment from the manufacturer’s official website. Most users in the automotive community seem to complain about the dust produced by these pads. But they will surely not disappoint when it comes to stopping power. 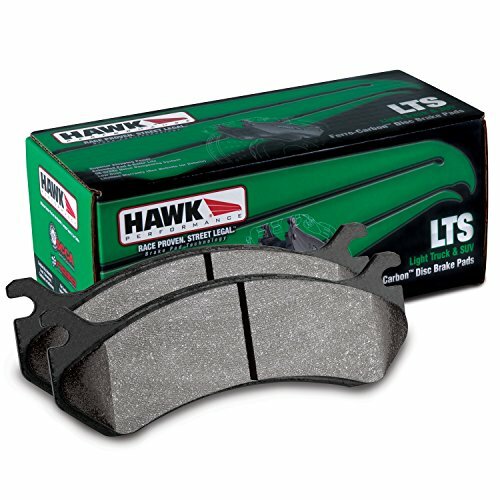 If you are searching for the best brake pads for towing, light truck and SUV look no further than the Hawk Performance LTS. With the LTS, Hawk Performance has simplified the process of upgrading your original brakes when you need tougher performance for towing. One of the most popular leading complaints after a brake job is noise and vibration. That’s why Hawk Performance LTS use either shaved backing plates or precision cut. The shaved backing plates reduce noise as well as vibration and ensure proper pad fitment in the calipers. 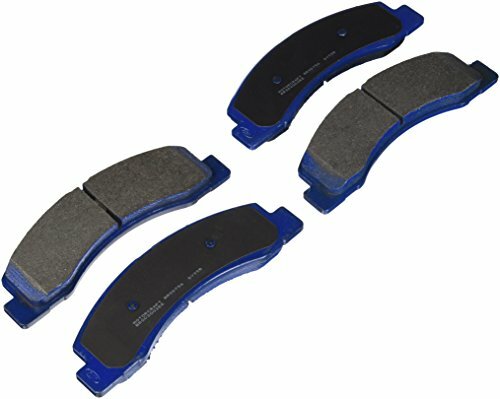 Hawk Performance also uses uniquely attached OE style shims that do an amazing job of eliminating pad vibration. Hawk Performance friction materials (Ferro carbon) are properly formulated and tested on brake dynamometers for optimal performance and extended service life. The friction material is positively molded and scorched for consistently reliable performance, which you will hardly get with conventional pads. These pads are integrated with grooves that help to breakdown surface gas films when the temperatures are high. This feature helps to minimize fading. Brake pads are important to the safety of your vehicle. With several options available, it is worth the research to figure out what is right for your vehicle. It is advisable to settle for a friction material that is standard for your tow vehicle. Most vehicles come equipped with ceramic pads. Therefore, you will either have to settle for upgraded aftermarket ceramic pads or semi-metallic pads. Learn the differences between the two materials here. Brake pads can either be bonded or riveted or a combination of bonding and riveting to the metal backing. Bonding is a technique of attaching friction material to the pad with a high-temperature, high-strength adhesive. The bonded technique provides longer service life simply because more material is usually available for lining wear before the pad contacts the rotor. However, you should not be misled by this feature. Therefore, you should not neglect lining wear until the disc pad hits the rotor. Bonded pads don’t possess the flexibility that comes with riveted pads. 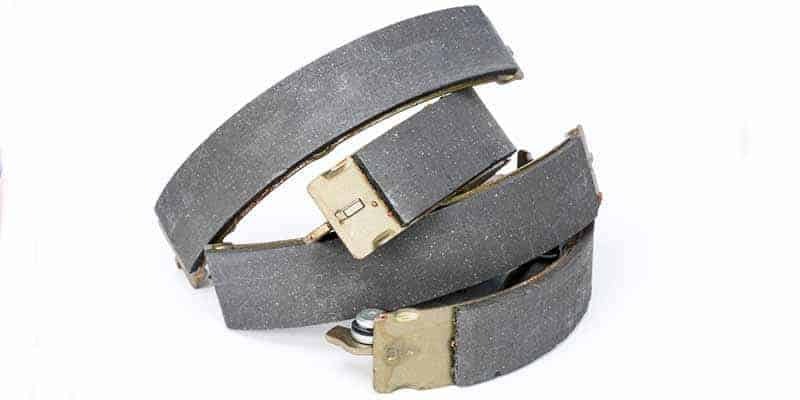 You can quickly fix a noise issue by replacing bonded linings with riveted ones. With this brake assembly, the lining is connected to the pad by aluminium or copper rivets, allowing the flexing between the lining and pad to absorb vibration as well as reduce noise. When compared to bonding, riveting is quite reliable because it maintains a secure attachment at high mileage and temperature. With riveted pads, about one-quarter or one-third of the lining thickness remain below the rivet for secure attachment. Riveting has been the most common technique for lining attachments. In fact, most semi-metallic pads feature a riveting technique. The amount of energy it takes to stop a towing vehicle is directly related to two factors – the weight of the vehicle and its velocity. A fully loaded towing truck at interstate speed needs considerably more braking force than a lightweight passenger vehicle. One way of dealing with that difference in stopping power is by adding more braking power. This is achievable if you use brake pads with a higher coefficient of friction. 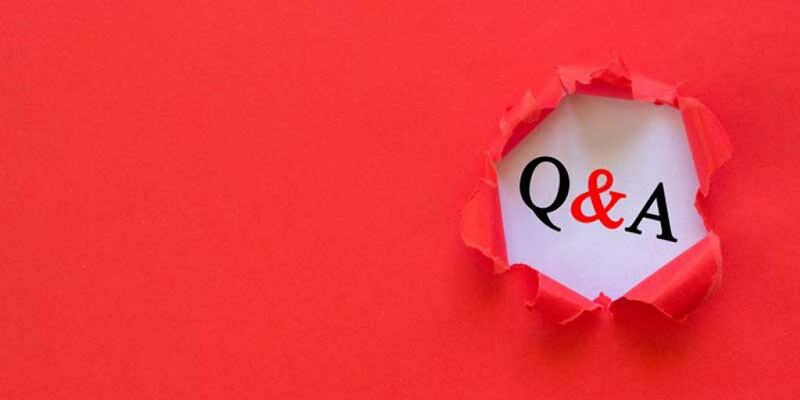 Usually, the coefficient of friction is equal to the effort needed to pull a material across a flat surface, divided by the weight of the material. If the coefficient of friction of the brake pads you choose is too low, stopping performance will suffer greatly. If it is too high, the wheels will tend to lock up under braking. Most brake manufacturers provide linings of different levels of quality as well as performance. Premium linings provide noise free braking and low dust. Premium brake pads are convenient for everyday use, but not for hauling and towing. The demands of towing are beyond the capability of premium pads. Upgraded linings, generally referred to as performance-street, are more performance oriented. These pads are ideal because they have higher pedal sensitivity and stopping power. Compromise to this kind of pads include a moderate increase in brake dust and noise and faster wear to the pad or rotor. Brake dust is released as the friction material in a standard brake lining carbonizes during normal braking temperatures. Some performance brake pads give off less dust in the street driving because they resist carbonizing until they are heated to higher temperatures. The best brake pads for towing must be able to provide high stopping power and fade resistance, even after repeated high speed stops. Even though some people may ignore these factors, I find them to be essential when selecting towing brake pads. The geometry and shapes of brake pads through chamfers and slots help to reduce noise. Angled chamfers help to reduce rotor or disc damage. Slots or grooves on the pads, rotors, or discs help to break down surface gas film during high braking temperatures. This improves the pads’ fading resistance. If your vehicle came with ceramic brake pads on it, then you are likely not capable of hauling or towing anything with it. Such a truck can be used as a passenger vehicle. If you are planning to convert your vehicle into a towing truck, then the ceramic pads that came on the vehicle might not be the best choice. In fact, in most cases when you opt to buy a towing truck, you start getting semi-metallic brake pads. Therefore, you should not treat a vehicle that has ceramic pads like one that has semi-metallic ones. Practically, you cannot tow or haul with such a vehicle. The simplest way to know what came with your vehicle is to look at the rotor that you took off. If the vehicle’s OEM pads were ceramic, you would see the material transfer from the ceramic pads to the rotor, which might be very obvious. The other obvious thing is the lack of a lip on the end of the rotor. A lip at the end of the rotor or a bumpy surface indicates that a vehicle came with semi-metallic pads. Semi-metallic pads are created from a mixture of synthetic or organic fibers as well as certain metals molded together. They are not made up of asbestos. Semi-metallic pads are harder and more fade resistant than organic materials but need higher brake pedal effort. Most semi-metallic pads contain around fifty percent iron and steel fibers. Also, copper has been used in semi-metallic. Ceramic brake pads are made up of a combination of ceramic material along with copper or some other metallic fibers. Semi-metallic pads operate best above 200 to 250 degrees Fahrenheit and must be warmed up to bring them to full operating efficiency. The high-temperature deterioration of semi-metallic pads is usually measured by thermal wearing down of organic ingredients. On the other hand, ceramic brake pads are known to be stable over a wide range of operating temperatures. The metal in semi-metallic pads usually does make noise, create lots of brake dust, and wear rotors, which affects the appearance of the rims and wheels. On the other hand, ceramic as well as copper composite pads produce much less noise, create almost no dust, and are not as damaging to the rotors. Brake pads are designed to follow the curvature of the brake rotor. Therefore, when the pads press against the rotor with great force, they produce friction and heat. Brake pads, both ceramic and semi-metallic, are a compromise between a number of factors, such as noise generation and pad life. Ceramic pads offer quiet operation and will not wear the brake rotors very first, but will themselves wear quickly and may not have the stopping power of semi-metallic pads. However, semi-metallic will cause more rapid wear and tear residue of the rotor and also tend to produce more noise and rust colored brake dust. Is it necessary to grease the back? Greasing the backing of your pads is necessary. Greasing or lubing helps to prevent rattling between the pad’s backing and the caliper or piston. After how many miles should I replace my pads? Depending on your driving style and repeated use, the brake pads should last between thirty-five thousand to sixty thousand miles. 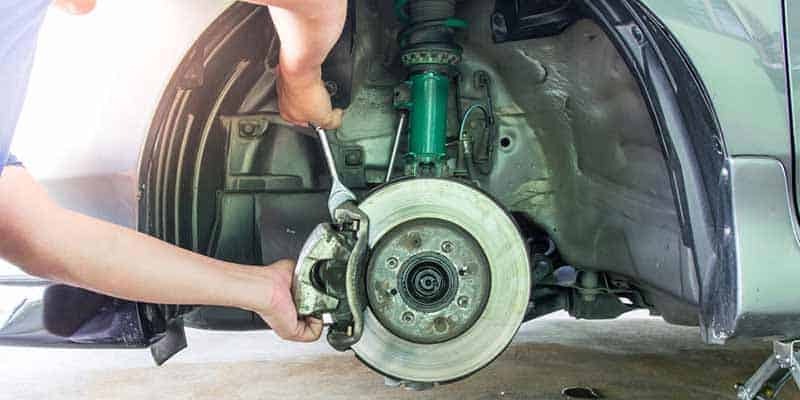 When should I replace my towing brake pads? 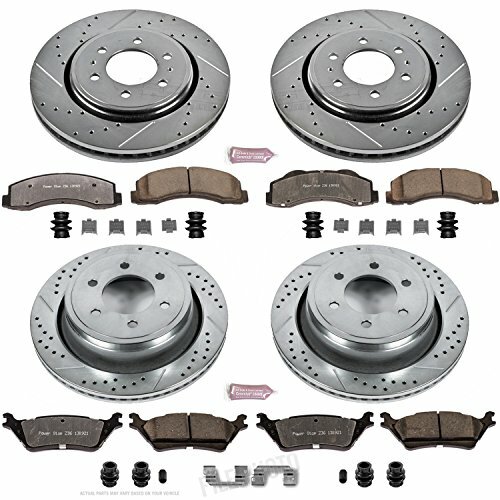 Can I reuse brake rotors? Never reuse a rotor that is worn beyond the ideal specification. Rotors can have an excellent physical appearance, but you can never be sure. It is advisable to use a micrometer to establish whether or not the rotors can be resurfaced or reused. You should measure rotor thickness, groove depth, and parallelism. What does brake pad glazing mean? A hard, glassy burnt appearance characterizes glazing to the lining surface. Glazed linings are produced by a brake pad that is lightly dragging along a drum. A glazed pad may cause squealing because more heat is required to achieve an amount of friction equal to a pad in good condition. One brake pad is not the same as another – a point to remember when shopping for the best brake pads for towing. I was able to select eight top-rated brake pads for hauling and towing after detailed research and comparison. According to my findings, the power needed to stop a towing truck requires brake pads that are specially engineered to deliver superior stopping power without many compromises. You may argue that premium pads are the best because they are noise free and produce less vibration and dust. That may be true, but when it comes to towing, braking power is all that matters. You have to make sure that the pads are of good quality to maintain rotor or disc life. Which brand of brake pads is the best? Do ceramic brake pads wear rotors faster? what is the best brake pad material for towing?